Deep 28/32nd" tread depth provides driving stability, low noise, and long mileage in over the highway, long haul applications. 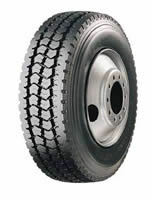 Stabilized center blocks resist irregular wear patterns and provide excellent overall traction. DSOC II technology optimizes casing life for long life and retreadability.